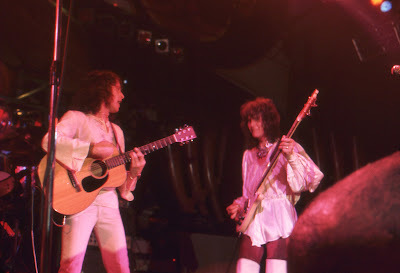 Yes began in 1968, when Jon Anderson (from Accrington, Lancashire), a singer and a former member of The Warriors, happened to cross paths with Chris Squire (from Kingsbury, London), a bassist and a former member of The Syn. The two British musicians, who shared a keen interest in the music of Simon and Garfunkel, played together in Mabel Greer's Toyshop, which soon became Yes, with Peter Banks on guitar, Tony Kaye on keyboards, and Bill Bruford on drums. Their first album, Yes, was released on Atlantic Records in 1969, followed by Time and a Word (with most of the tracks featuring a full orchestra) in 1970. In common with other British bands of the late 1960s (The Moody Blues, Pink Floyd, Hawkwind, King Crimson, Procol Harum, Jethro Tull, Renaissance, Van der Graaf Generator), Yes strove to expand the musical potential of rock'n'roll. Their adventurous approach was founded on an expert combination of vocal harmonies, long compositions with majestic structures, and a high degree of superlative musicianship. 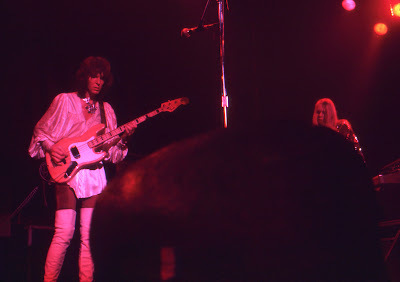 By the time of their third album, The Yes Album (1971), they had succeeded in shaping their symphonic sound to near perfection. 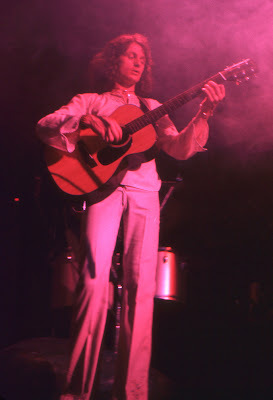 Fragile (1971) and Close to the Edge (1972) were further examples of their musical growth. 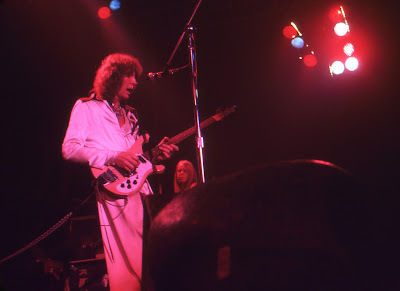 When Yes appeared at Winterland in March of 1974, Peter Banks, Tony Kaye, and Bill Bruford all had departed. 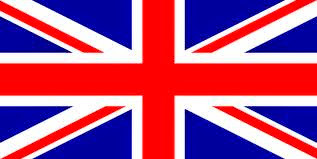 (Peter Banks formed Flash, Tony Kaye formed Badger, and Bill Bruford joined King Crimson.) 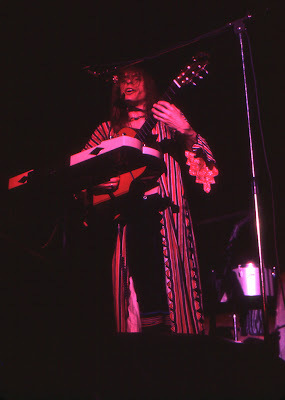 In addition to Jon Anderson and Chris Squire, the lineup of Yes now included Steve Howe (formerly of The Syndicats, Bodast, and Tomorrow) on guitar, Rick Wakeman (formerly of The Strawbs) on keyboards, and Alan White (formerly with Ginger Baker's Air Force and The Plastic Ono Band) on drums. In many ways, it proved to be the strongest lineup in the history of Yes. 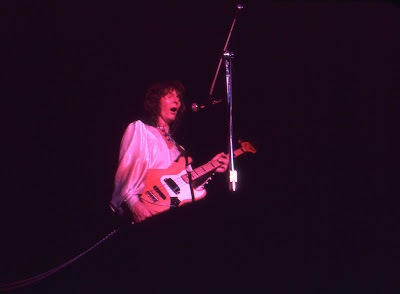 The release of Tales from Topographic Oceans, the double album that Yes performed while on tour in 1974, caused a fair bit of a disturbance, both among their fans and within the band. It was unquestionably an ambitious work, inspired by Hindu scriptures (in particular, a footnote in Autobiography of a Yogi, by Paramahansa Yogananda) and lasting nearly ninety minutes. 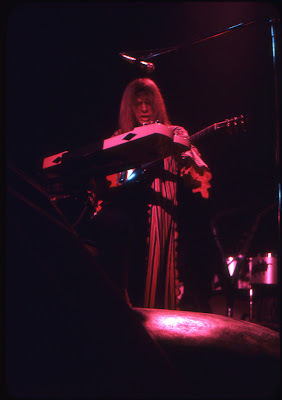 Some fans, and most reviewers, regarded it as being too long and too difficult, and Rick Wakeman made it known that he was unhappy with it. 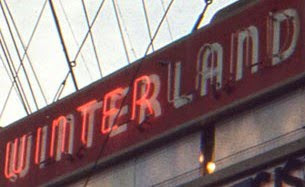 Nevertheless, the crowd at Winterland responded to the performance with great pleasure, with everyone pushing toward the stage in an effort to get closer to the musicians. 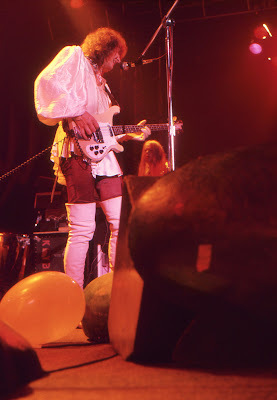 Along with the weighty music that Yes offered to listeners, the stage at Winterland was adorned with a number of imaginative objects designed by Roger Dean, the English artist who had done the otherworldly covers of their albums, beginning with Fragile. It was a bold and enterprising attempt by Yes to create and sustain a distinct mood that would be supportive of their carefully wrought songs, while also providing a more complete experience for their audience. 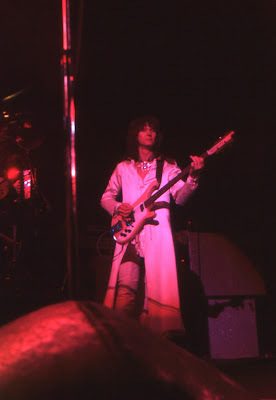 The musicians of Yes were extremely polished in their collective performance, and always interesting to observe. 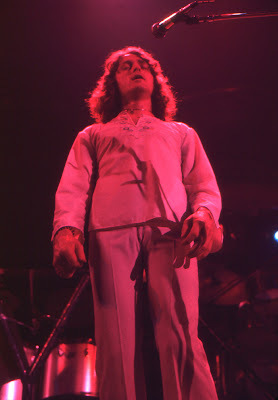 Their overall showmanship was colorful and impressive: Jon Anderson sang with breathtaking clarity, Chris Squire sprang across the stage in white boots, Steve Howe exchanged one guitar for another throughout the show, Rick Wakeman's blond hair gleamed in the spotlight as he stood over his keyboards, and Alan White underpinned everything with vigorous activity on his drums. A concert by Yes was a glorious example of music being taken to its loftiest heights. 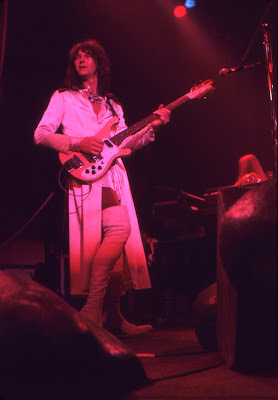 David: Five days after seeing the Man/Hawkwind concert in Berkeley, we were back at Winterland for the Yes concert. 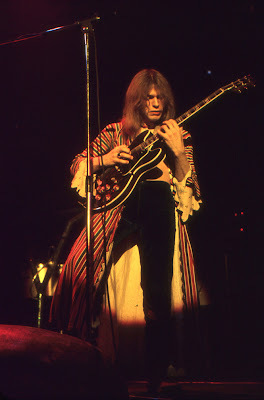 I had seen Yes at Winterland just eleven months before. At that concert they performed Close to the Edge. This concert they performed Tales from Topographic Oceans. There has been controversy about that album ever since its release. I tend to think that Yes went over the edge on that one. The concert itself was mesmerizing. Their artistry, skill, and musicianship was amazing. It was like they had been sealed up somewhere taking music steroids since I last saw them, and were now unleashed on us with a power unheard of. 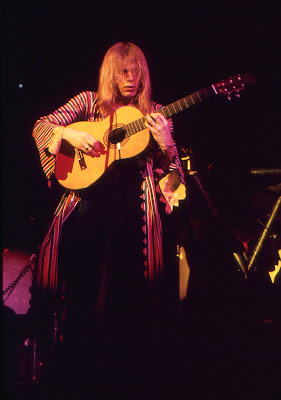 Just watching Steve Howe play his various guitars with such intensity was awesome. 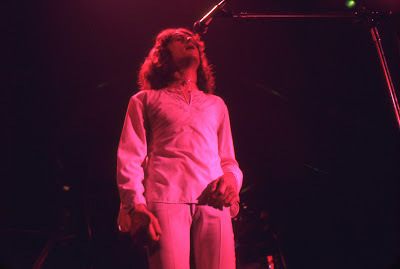 Jon Anderson's elf-like presence was wonderful. He always seemed to be looking out past the audience, focused on something that only he could see. 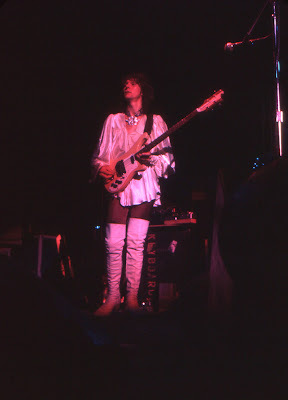 Chris Squire moved and jumped about in his thigh-high boots, pounding out powerful bass notes. Rick Wakeman, though nearly out of my line of vision, could be seen sparkling in his rhinestone cape, producing out-of-this-world sounds. 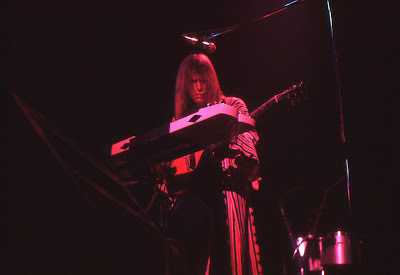 The stage was a huge design by Roger Dean, their cover artist. It looked like we were in the belly of a whale and could see its rib cage overhead. The monitors were behind some round, mushroom-looking things. Being right up to the stage was not the best way to view the stage design. It is hardly visible in the photos. The whole effect is somewhat lost being that close. 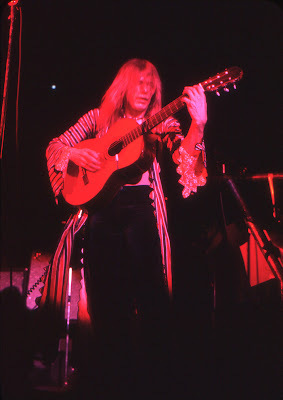 Still, I preferred being close enough to see Steve Howe's fingers dancing on the guitar strings. The whole concert was a fantastic and unforgettable show. 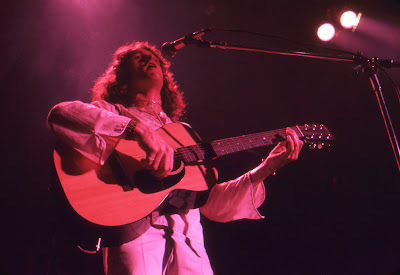 Gary: As I remember, this was the Yes tour that promoted the new Tales from Topographic Oceans (and was just after Yessongs, a live three-LP set). I think this show started with the prerecorded orchestral finale to Stravinsky's Firebird and then went into "Siberian Khatru," like the Yessongs album. 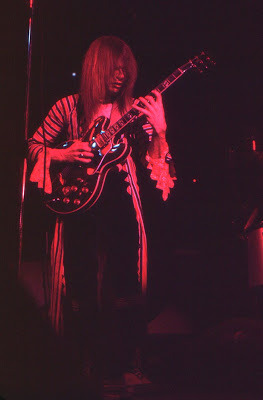 I was impressed with Steve Howe's playing. 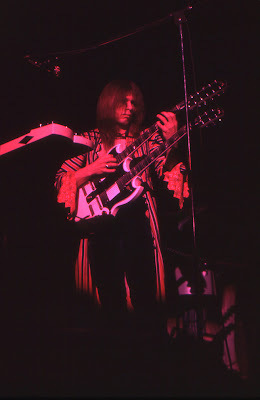 He had a double-necked white Gibson and another guitar on a stand, so that he could play slide without taking off the double-neck. Tales from Topographic Oceans was played almost in its entirety. 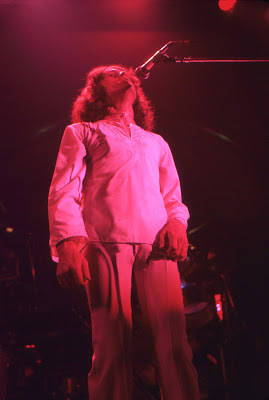 Michael remarked that he was very impressed by the large number of fans who had actually memorized the lyrics and odd time signatures when they sang along with the band. Yes also did Close to the Edge. Rick Wakeman's organ part was very well done. The sound was great. Alan White was the drummer. We were used to Bill Bruford, but the band was very tight. I think there was a section where they all played percussion instruments. 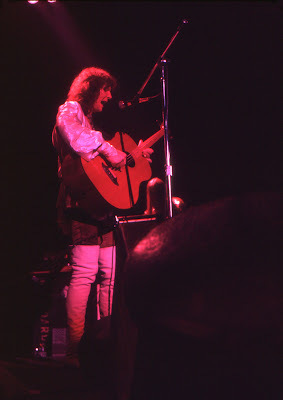 Jon Anderson played a bit of acoustic guitar in addition to his singing. I enjoyed the concert, although I think Tales from Topographic Oceans was a further step away from the friendly side of Yes (The Yes Album and Fragile). The music was more complex and less tonal. Even the recorded sound itself seemed more remote and distant. 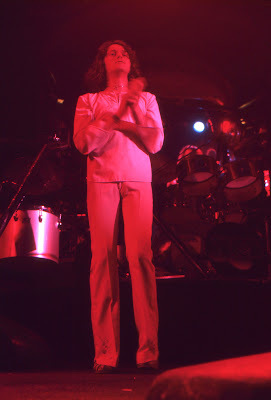 Michael: The concert at Winterland in 1974 was not the first time that I had seen a performance by Yes, but it particularly stands out in my mind. 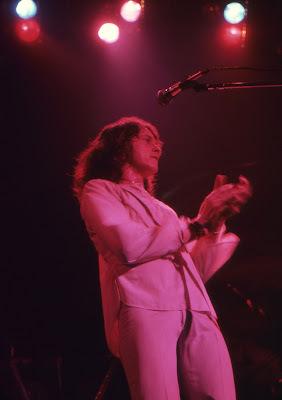 By then, the music of Yes had begun to reach a much wider audience (which was quite amazing considering how demanding their music could be), and as a result, Winterland was packed with their fans that evening. I loved prog rock (and still do), and I particularly loved Yes. In contrast to the dark music of King Crimson, Jethro Tull, and Van der Graaf Generator (also bands whose music I loved), the music of Yes was more colorful, with a brighter outlook. I was in total awe of their musicianship. 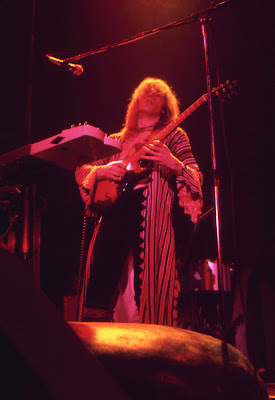 Steve Howe, Chris Squire, and Rick Wakeman appeared to be almost superhuman in their abilities, and Jon Anderson's voice was beautifully (and sometimes beatifically) expressive. As usual for us with a concert at Winterland, we waited in line all day, which allowed us an opportunity to catch a glimpse of the musicians in the afternoon, when they arrived to do a sound check. They appeared to be a bit overwhelmed by the many fans who crowded around them as they stepped out of their limousines. It seemed that the members of Yes were not yet accustomed to the sudden increase in their fame. The concert itself included music from their latest release, Tales from Topographic Oceans, an album that comprised an extended composition in four parts, spread out over two LPs. Listening to the long pieces of serious music in a hot and sweaty venue was not an easy thing to do. We were standing at the front of the stage, with the rest of the crowd crushing against us from behind, and I remember that I had several moments of feeling faint. The music was worthwhile and engrossing, but I must admit that the physical experience of being there was somewhat uncomfortable. These pictures are wonderful. Thank you! Did Chris play "These Boots Are Made For Walking" during his solo? I was at these shows, and from the angle of the photos, we must have been next to you! What was your impression of Topographic Oceans and the tour? Do you remember the percussion setup for "The Ancient"? Anderson had his own percussion set up to Alan White's right hand side. Tom, toms, chimes, cymbals, you name it. I was at the Winterland show for Topographic Oceans. It was amazing, the set was jaw dropping, the music fantastic and was "out there"..just as I like it. This was not the first time I had seen YES. I had seen them before when they were 2nd bill to Black Sabbath, and that was at Winterland also. Wild Turkey opened that show. Do you have any memory of who played what percussion duruing "The Ancient"? Hi there...I too have seen YES a total of 19 times, the first being in support of the TORMATO album, in 1978, at TORONTO'S MAPLE LEAF GARDENS. 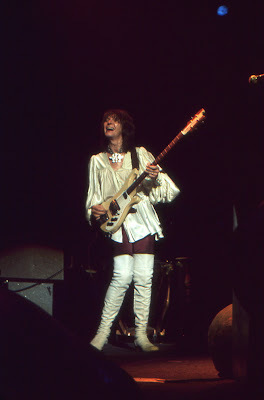 I was heavily into YES well before that show, but was unfortunately unable to attend any concerts untill '78. 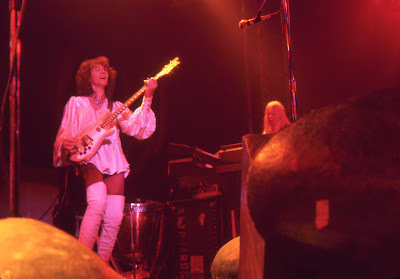 They did not even come to Toronto during the RELAYER/SOLO'S tour, in 1976, the closest show being in Detroit, at COBO HALL, and I was just a tad too young to make the trek, being only 15 at the time of the concert. The last time I went to see YES, was 2008, in TORONTO'S MASSEY HALL, and I didn't even get to see them, because I was taken down by a CLUSTER MIGRAINE, so I had to sit in the stairwell, just outside of the theatre proper, so I did get to hear the whole show, and the very nice usherettes would constantly bring me towels filled with ice, so I could keep them on my temples and forehead!! 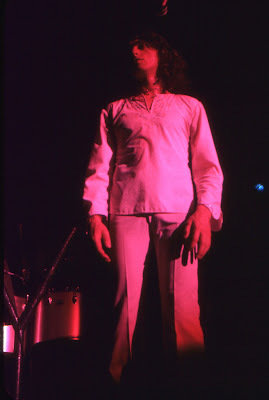 JON ANDERSON wasn't on this tour, and hasn't been with the band since the mid-2000's. 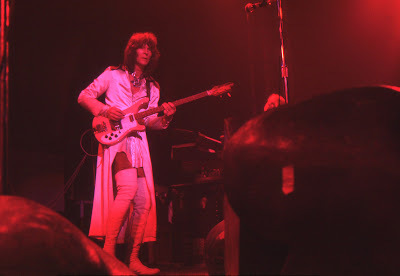 He was very upset that YES continued on with the tour of 2008, as he was supposed to be included, but due to a throat infection, and Dr.'s strict orders, could not perform. I do not know why YES did ultimately go forward without the voice that makes them who they are, and I fear that Anderson will never take the same stage again, with his long-time collaborators! To be perfectly honest, I don't blame him one bit. That whole scene was a stab in ANDERSON'S back, imho. who really knows though? ANDERSON may well put those feelings aside, and again take the stage with, possibly THE best progressive band in history. I say possibly, because GENESIS, circa 1970-1978, were, again imho, THE BEST progressive band, EVER! You may argue that opinion. 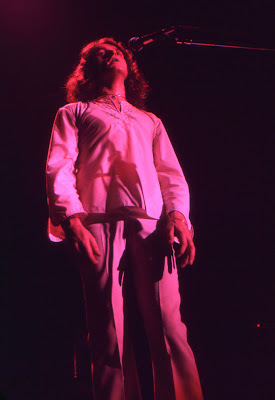 Never have I seen so many amazing pictures of old-school Yes live. Thank you very much and keep scanning more. 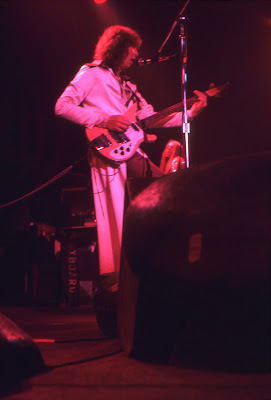 Saw Yes in Chatham at the time of the"Yes Album". Loved this post and David's Rock Scrapbook entries on Rick Wakeman's projects. In those days going from house to house where my friends lived we could almost always plan on someone playing Yes, or Wakeman's music, particularly Six Wives of Henry VIII. Great pictures. I hope someone points members of Yes at them. Yes at their peak! It's a shame no soundboard or motion picture recordings exist from this tour. Thank you so much for putting in the work all those years ago and sharing with us now. People don't realize how much work goes into getting such incredible shots! MY GOD what I have missed by being too young then. 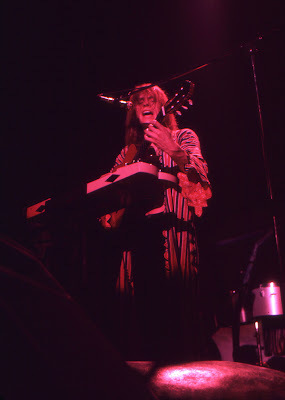 I became enthralled with Yes at the age of 12 in 1972 when first listening to Time and a Word. 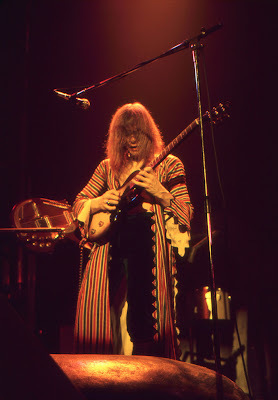 I saw Yes in 1974 in Toronto on their YesSongs tour; the ticket was a whopping $8 and to date YesSongs is one I cherish as much as Floyd's Dark Side Of the Moon. I forgive Yes for the 90125 album; we all make mistakes. Since I refuse to pay $100 for crap seating and equally dismal arena acoustics, I bought Symphonic Yes DVD and I would suggest that any Yes fan should own it; it gives you the best seats and acoustics in the house for $25. I was at the Manchester Free Frade Hall TFTO show about a month before the album came out. Great show and we were all on the front row with Rick just in front of me.Dont remember any curry being eaten onstage though! In 1975 myself and some friends went to the Reading Festival by which time Pat Moraz had joined. The stage set was still the full Topographic one and my friend Paul Gillet (who I lost touch with some years ago)took along his Nikon and took about a hundred slide shots of the set. The results were amazing and I really wish I could get in touch with him again as Pauls photo slides were better than any shots I have seen of the Topographic Roger Dean set. I just saw YES at the Warner Theater in Washington, DC. (08/04/12) They have a new singer, Jon Davidson or Davison. He is about 99.999 percent the sound of Jon Anderson. If you were not looking at him, you would have thought you were listening to Anderson. Everything else (everyone else) sounded great too. Great music, and lots of energy. I have always thought that they are better live than on record. Really love the photos, especially those of Chris and Steve. 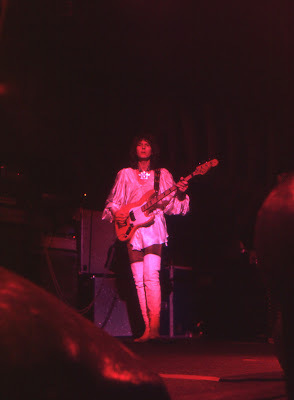 Really wish I could have seen the Topographic Oceans tour, but my first YES show was in 1975 for the Relayer tour, with the amazing "Crab Nebula" stage monster designed by Roger and Martyn Dean. 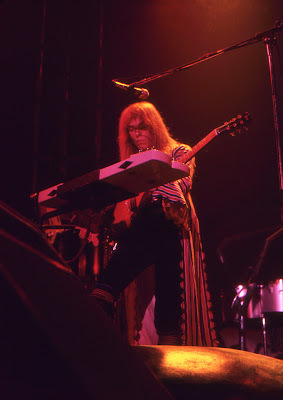 Fave show was on the Tormato tour when they had the round stage...Steve Howe sent shivers down my spine that night and the suspended sound system was probably the best sound I've ever heard at a YES show. just saw the three album tour @ the carnegie library in pittsburgh,pa..very small intimate venue.acoustics were awesome..i've remained a fan thru all the changes and always will be. Thanks for the great photos. I saw Yes on this tour a little earlier in the year in Philadelphia. I am an enormous yes fan. Outstanding photos! Thank you for sharing your memories of the concert. I completely agree with David's comments: "It was like they had been sealed up somewhere taking music steroids since I last saw them, and were now unleashed on us with a power unheard of." 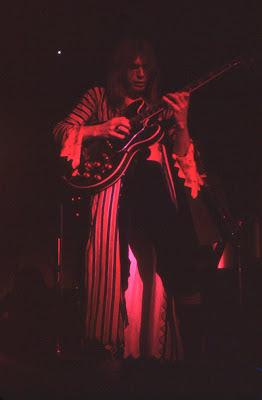 + "Steve Howe's fingers dancing on the guitar strings". They are at the apex of their musical abilities on this tour, especially Squire and Howe. Just listen to Howe's solos at the end of Siberian Khatru and the opening, pre-vocal section of Close To The Edge during this tour. The guy was on fire, playing with a speed and complexity that is beyond anything he played before and after. It's an amazing thing to listen to. 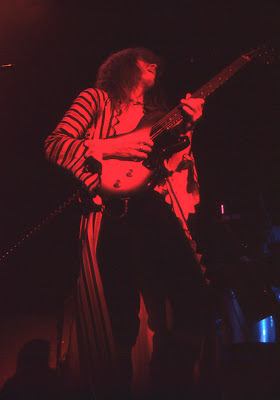 I find it ironic that Howe was voted Best Overall Guitarist in Guitar Player magazine five years in a row, 1977-1981, a time at which he was still superb but not nearly as good as his playing peak of 1971-1974. We all reach a peak in things and 71-74 was Howe's. Does anyone have any memory of who played what in terms of the percussion during "The Ancient"?